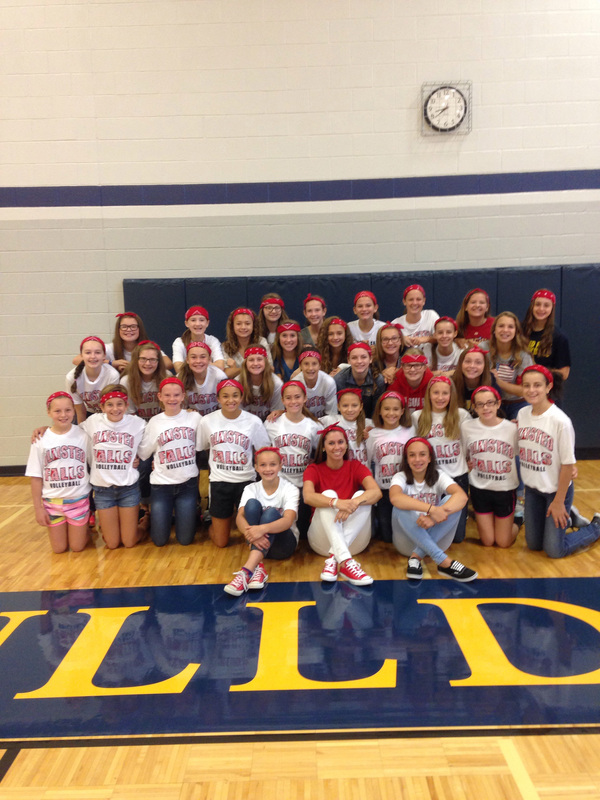 NO DOUBT – OFMS IS A COOL SCHOOL! WATCH FOX 8 TOMORROW – THURSDAY A.M.
A big THANK YOU to all who voted for the Olmsted Falls Middle School on Fox 8. 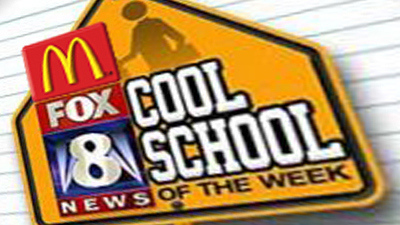 The school will be the featured Fox 8 Cool School of the week on the Fox 8 Morning Show TOMORROW, Thursday, September 17th during the 6 o’clock hour. The segment will air live at approximately 6:40 a.m. The OFMS Cool School segment will also be replayed on the 4 p.m. newscast THURSDAY afternoon and on the Noon newscast on FRIDAY. A Fox 8 crew visited the school Tuesday and took video of some of the school’s ‘cool’ happenings. They included the Bulldog Theater Club’s performance of The Little Mermaid, WEB program, Spanish and French programs, Project Lead the Way Pre-Engineering class (pictured at left) and Life Skills: Naviance Program. OFMS would like to extend special thanks to Fox 8’s Maria Scali for taking a break from filming and producing the OFMS Cool School segment yesterday to speak with students in Miss Robertson’s Life Skills class about her job as a multi-media journalist and her personal career path. Her visit and remarks were timed perfectly as students were in the process of using the new Naviance program to explore different career pathways that may be of interest to them. Thank you for sharing your passion and experience with our students! Maria Scali’s visit makes OFMS a Cool School! Last week’s blog highlighted several OF student activities in remembrance of the 14th anniversary of 9/11. 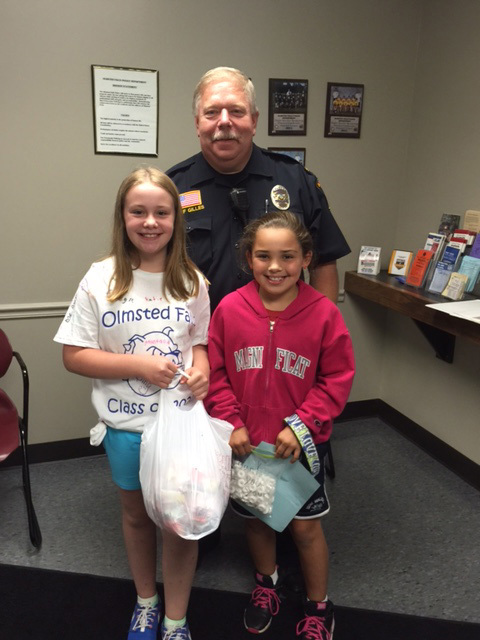 OFIS’ grade 4 Student Council voted last year to sponsor its “First Responder Day” on 9/11 this year. Each team of classes was invited to adopt one local police or fire department. Students on each team wrote thank you letters. Some teachers and students baked or bought in goodies to further express appreciation. They also made signs and placed them around some of the safety forces stations. 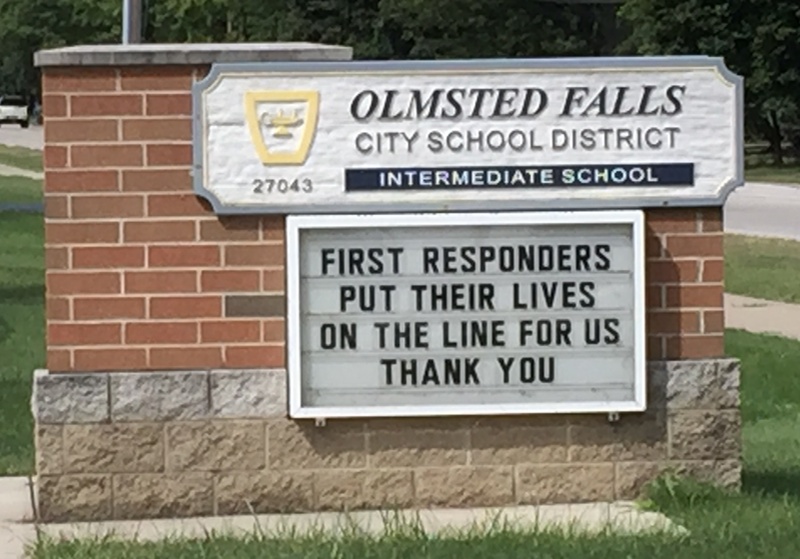 Kudos to our OFIS student leaders for initiating this much deserved recognition of our first responders locally! New teachers and administrators in the Olmsted Falls School District attended the Olmsted Falls Kiwanis Club’s September meeting, in what has become a long-standing tradition of community building. Teachers join Kiwanis Club members for dinner, are introduced by their principals and get an opportunity to meet community members who are actively involved in supporting our schools. OFSD Superintendent Dr. Jim Lloyd, Assistant Superintendent Mrs. Kelli Cogan and new Treasurer Mrs. Emily Dales also attended. Thank you Kiwanis for your ongoing support of the students and staff of Olmsted Falls School District! 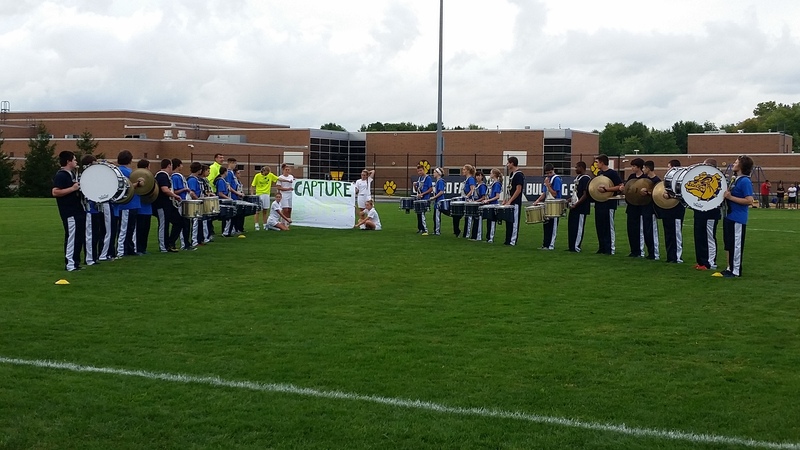 CAN’T GET ENOUGH OF OFHS MARCHING BAND? CHECK OUT PERFORMANCE VIDEOS. School hasn’t been in session long, but the OFHS Marching Band is racking up performances. Some are available here to view if you haven’t seen their performances or want to relive them. Links to these performances can also be found on the marching band’s and OFMA’s facebook pages. To view the performances, click on the name of the event: Parma’s Byers Field ; Westlake ; 9/11 pre-game show ; 9/11 half-time show and Band A Rama. Parents of grade 7 students, we thank you if you have already submitted documentation of your seventh grader having received the Tdap booster. If you have not yet submitted this documentation that the state of Ohio requires, please do so as soon as possible. We will prohibit your student from attending school if we have not received that verification in our clinic by October 1st. If you have questions about the Tdap booster, please contact Mrs. Koenig, the OFMS clinic aide, at 440-427-6212. Thank you for your attention in this important matter. 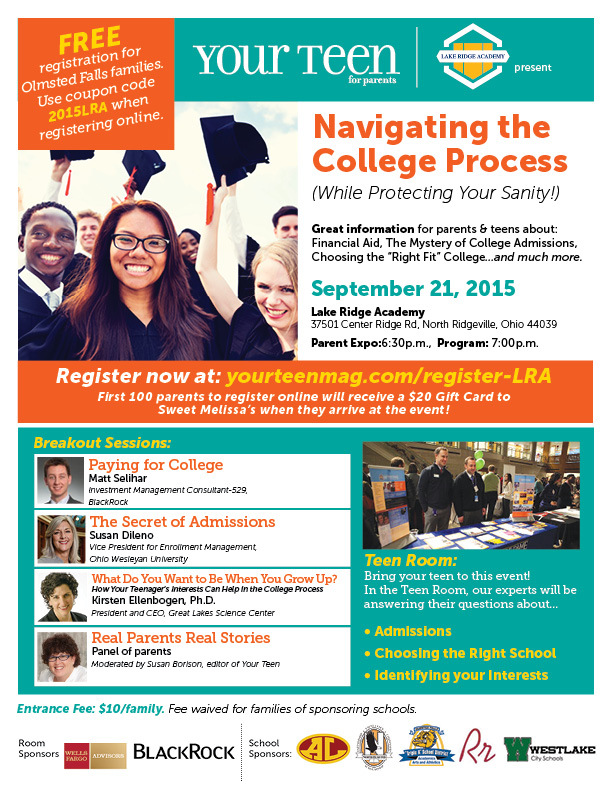 Your Teen Magazine and Lake Ridge Academy will lead interactive discussions at a September 21st college expo to help students navigate the college process successfully. There will be two $500 college scholarships given away among those attending the event – BE SURE TO GET REGISTERED TODAY! Register now for Navigating the College Process and your registration automatically will enter you for a chance to win a scholarship from either Your Teen or Sweat X. You must be present for the drawings at the event, which is at Lake Ridge Academy, to win. To register for the 6:30 p.m. event, click HERE. The OFHS again will offer its student College Lunch Bunch for those having questions about choosing a college and completing applications. They are on selected Tuesdays during lunch and study halls from September 29th to November 24th in the Guidance Office. A flyer with a list of dates is available by clicking HERE. 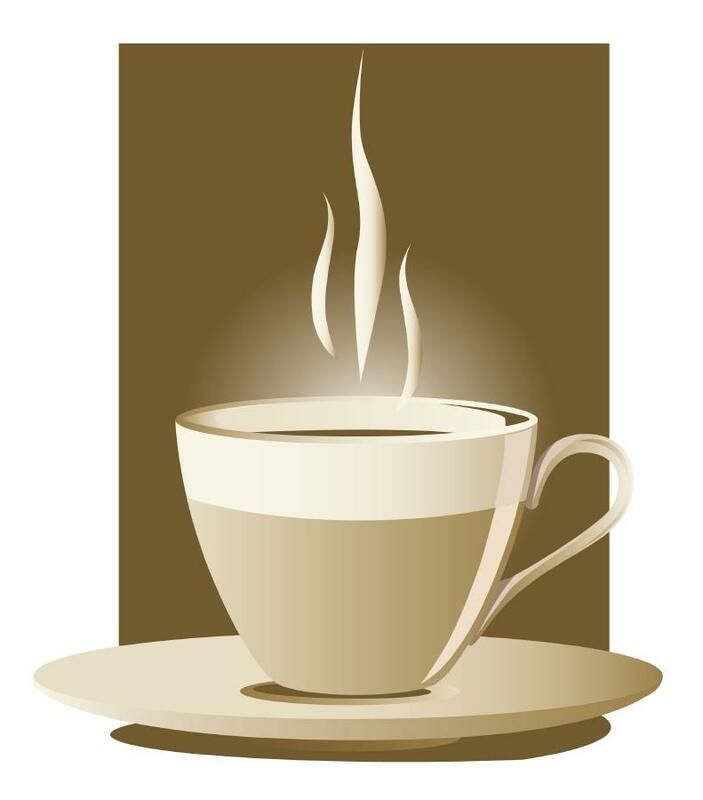 Parents are invited to College and Coffee, an informal information sessions about the college application process, senior timeline and financial aid in the OFHS Media Center . Sessions are on 8-9 a.m. September 24th; 7-8 p.m. October 8th; 8-9 a.m. October 22nd and 7-8 p.m. November 5th. A detailed flyer is available HERE. Dine in, carry out or drive through North Olmsted’s Chick-fil-A Monday, September 21st with an order and help OFHS Post Prom raise money at the same time. Just mention the organization when placing your order from 6:30 a.m. to 10 p.m. that day and OFHS Post Prom will earn 25% of the sale. The annual OECPTA Autumn Attic Sale is from 8 a.m. to noon, Saturday, September 26, at the OFMS. The deadline to reserve a selling spot is TODAY – September 16th. Sellers manage their own table and keep all of their profits of new or gently-used children’s items. There is a $25 registration fee for members per space and $30 for non-members. Early bird entry is from 8-9 a.m. at $5 a person. The general public is from 9 a.m. to noon at $2 a person. To download a seller’s registration form, click HERE. Three players, coaches and an entire team will be inducted during the Olmsted Falls Alumni Association’s annual Athletic Hall of Fame dinner October 22nd. 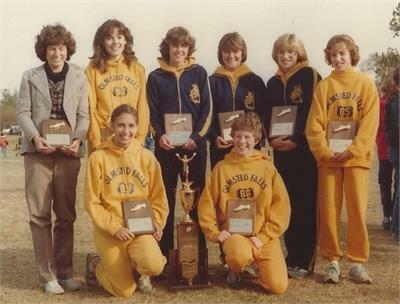 Inductees include James Laut, ’61; Gary Slusar, ’92; Rush Williams, ’03, Coach Jim Ryan; Coach Patrick Donahue; Coach Bill McGrain and the 1980 Girls Cross Country Team. For photos of the inductees, please click HERE. The Induction Ceremony and Dinner is at 5:30 p.m. at the German American Cultural Center, 7370 Columbia Road. Tickets are $35. The community is invited to attend. Reservation forms for the ceremony is available by clicking HERE or contacting Cathy Hess with the Alumni Office, 440-427-6030 or emailing ofhsalumni@yahoo.com. If you love comics, Wimpy Kid books and graphic novels, the “Discover Your Creatoonity” is for you. Artist Jeff Nichols will be at the Olmsted Falls Library at 11 a.m. this Saturday, Sept. 19, to teach those in grades 3-6 how to draw cartoon characters. Register online by clicking HERE or calling 440-235-1150. A moment of silence during this morning’s announcements at OFHS. A moment of silence immediately following this morning’s Pledge of Allegiance at OFMS. A moment of silence is also planned prior to tonight’s first home football game of the season, as well as a special “Salute to America’s Finest” tribute by the OFHS Marching Band band. The color theme at tonight’s game is red, white and blue. OFHS & OFMS students and staff wore red, white & blue today showing their pride and recognition of fallen heroes and first responders who helped others. Bandanna” for his selfless, heroic actions during his final hour at the World Trade Center. OFIS students from the Mr. Judson/Mrs. Pilko/Mrs. Stanczak Team made a class quilt and treat bags to deliver to the Olmsted Falls Police Department to thank them for being our local first responders. These students – along with students from Mrs. Rodgers’ and Mr. Holzworth’s classes – also made thank you signs that were placed in the lawn in front of the police station. To view a gallery of photos from some of today’s activities, please click HERE. Each year, the Ohio Department of Education (ODE) publishes “efficiency targets” for all school district transportation departments. 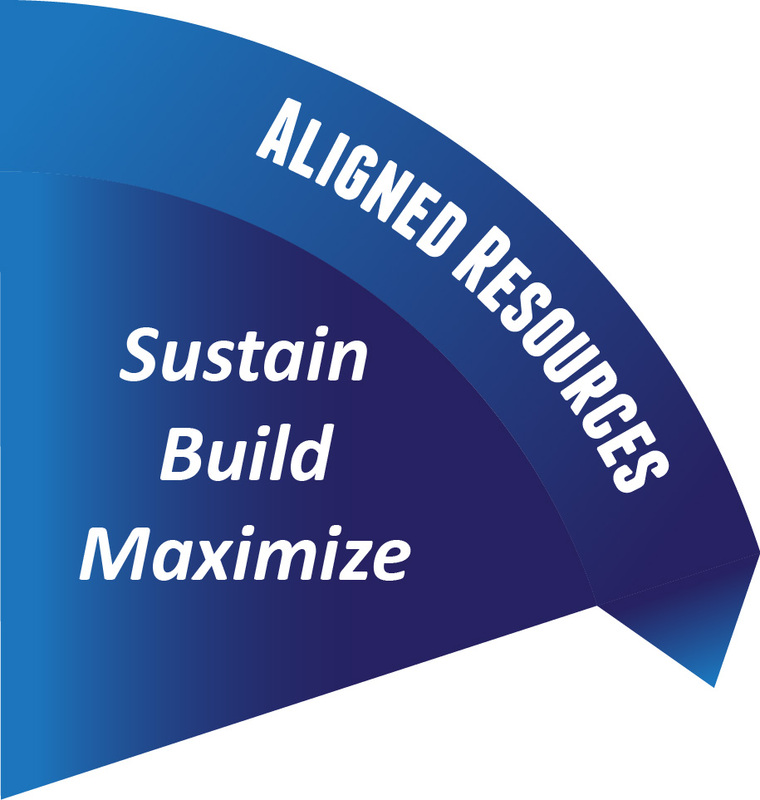 ODE uses a formula to grade each district’s ability to utilize the resources that they have and not operate wastefully. A rating of 1.0 is the target for each school district based on the data. The latest efficiency rating for Olmsted Falls City School District (for fiscal year 2014) was 1.16, which is well-above the efficiency target and the highest rating in Cuyahoga County of the 31 districts shown in the report. Efficiency in OFCS Transportation can be attributed to the district’s use of large 84 passenger buses which allow us to carry more students per bus (Rank 19th of 501 districts reporting in Ohio), our ability to make each bus last at least 20 years (Ohio average is roughly 10 years), and our three route bus scheme which includes high school student transportation. Based on adjustments in the District’s routing scheme for this current school year (versus last), the District expects to see its efficiency score be even higher for fiscal year 2015. 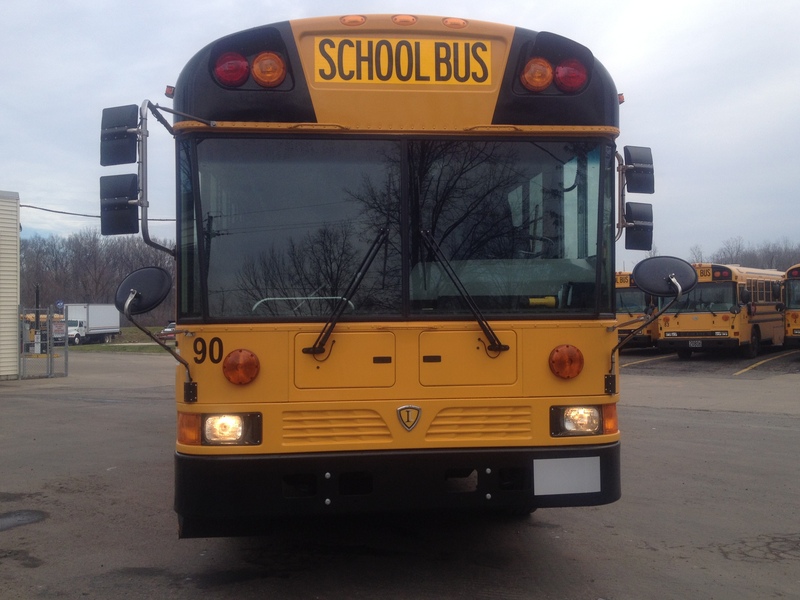 Kudos to the Olmsted Falls Transportation Department for being mindful of how we can continually maximize and improve the operating efficiency of our bus fleet! BE A MYTH BUSTER: KNOW THE FACTS! MYTH: Parents have a legal right to withdraw (opt-out) their child from participation in state-mandated testing. Ohio law requires all districts and schools to test students in specific grades and courses. There is no law that allows a parent or student to opt out-of-state testing and there is no state test opt-out procedure or form. Districts do not have the authority to give a child permission to skip testing. Ohio Revised Code Chapter 3301 mandates that the state board of education adopt rules establishing a statewide program to assess student achievement, and that those achievement tests be aligned with the academic standards and model curricula adopted by the state board of education. Once those tests are developed by the state board of education, state law requires that each school district administer the tests. There are very limited and specific reasons in the law that would excuse a child from taking all or part of the achievement tests mandated by the state. For example, special education students may be excused under certain circumstances if the individualized education program developed for the student provides for an alternative assessment. Likewise, students may be excused for medical reasons or any other good and just cause approved by the school, in which case a make-up test must be administered to the student within nine days of the originally scheduled date. (Ohio Revised Code 3301.0710). Again, the law does not provide for a general “opt out” of state testing. About Myth Busters: With continuing and significant changes underway in public education – from the implementation of the Common Core State Standards to the launch of new required state assessments – it is important that parents have the facts. Knowing the real facts can help Bulldog parents spot a myth when they hear one – and there are currently a number of myths out there. 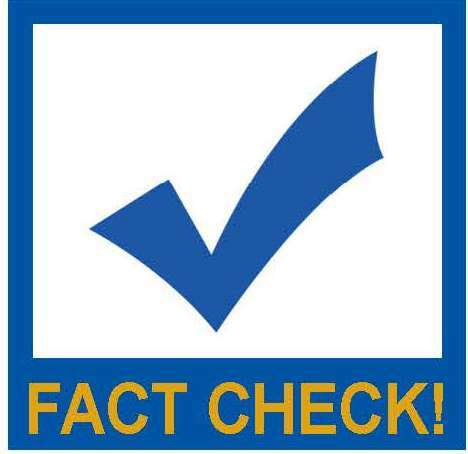 Olmsted Falls School District will feature periodic “Myth Busters” on our Weekly Blog Post. We hope parents will find this new feature informative and, as always, we encourage you to contact your child’s school building or the Board of Education office with any questions. To view other recent “Myth Busters,” please click HERE. 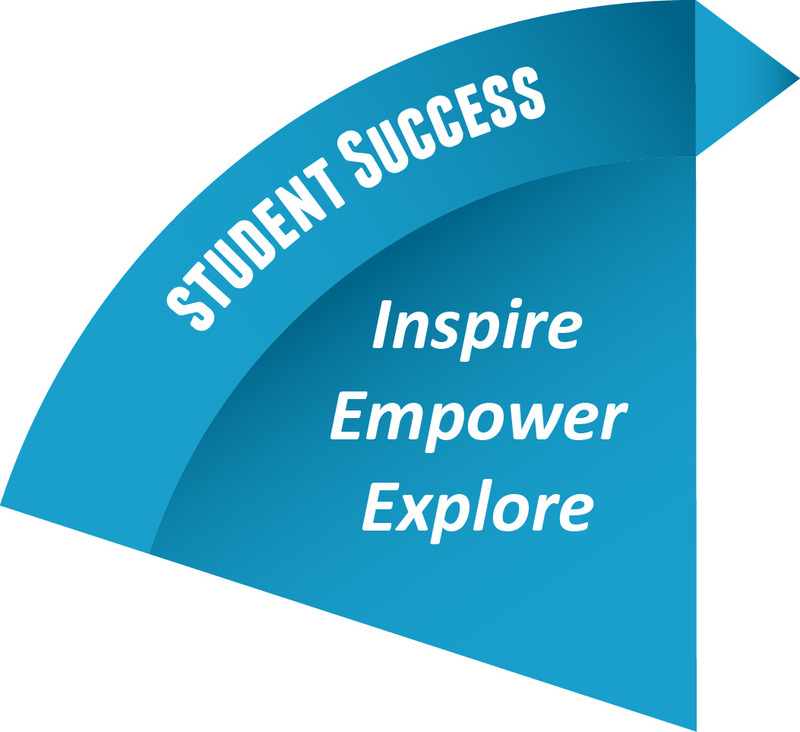 Many thanks to all of those parents and guardians who have already logged in to your PowerSchool Parent Accounts and submitted the annual required student information updates for the current 2015-2016 school year. Please note that this information MUST BE UPDATED BY THIS TUESDAY, SEPTEMBER 15, 2015 in order for your student to continue to attend school. Students WITHOUT completed information/forms updates after Tuesday, September 15th will be prohibited from attending school until the required updates have been submitted to ensure that all health and emergency contact information is current and correct in the event of an emergency. This annual update that all parents of returning students are asked to complete includes important Emergency Medical and Emergency Contact information and is critical to the safety of your son/daughter. All parents of returning students should either already have an existing PowerSchool Parent Account or have been contacted by your child’s school building with information regarding setting up a new PowerSchool Parent Account, which will allow you to access the link to update information for your student(s). If you have an existing PowerSchool Parent account, know your username name and password, and would like to login now to complete this important update for your student(s), please click the following link: https://psof.nccohio.org/public. Once you have successfully logged in to your account, please click on the “Returning Student Registration” link, located on the left-hand side of the screen to get started. NOTE: Updates must be made separately for EACH student in your household, however the system will automatically transfer basic information changes made in the first student’s record (i.e. address, email or phone number) to the next student’s record to make the process of updating multiple students more efficient. If you need assistance in accessing or setting up your PowerSchool Parent Account, please contact your child’s school building as soon as possible. Assistance can be provided for those who may not have access to a computer or the internet. Individual buildings will begin following up directly with those families who have not yet completed the online student information update next week – please plan to watch for and respond to these important emails. Thank you to all parents and guardians for helping us to ensure that we have the most up-to-date information for your child each school year. 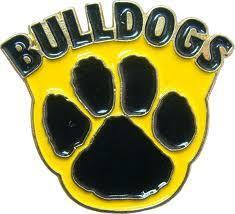 Bulldog Pride! 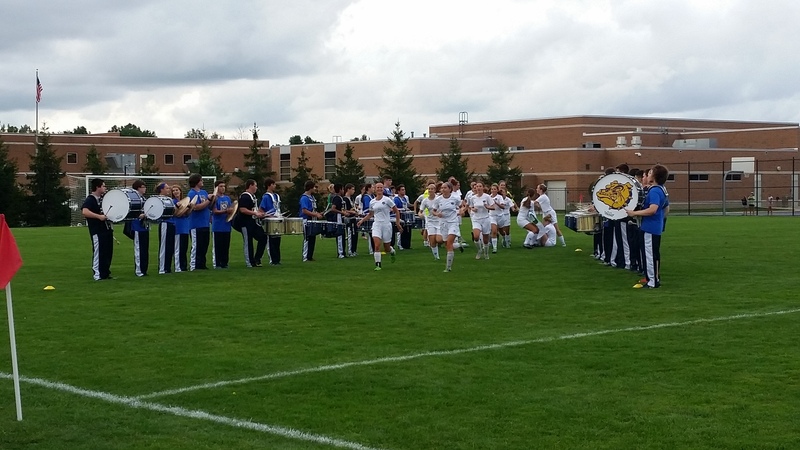 The OFHS Marching Band was on hand this past Wednesday night to add some extra Bulldog spirit to the Varsity Girls Soccer match against Amherst Steele. Many became OFHS PTA during the school’s open house. By doing so, they were entered into a drawing. The winners are Renee Palyo, Uncle John’s Plant Farm $25 gift card; Tom Bridle, Brio $25 gift card and Laura Gaba, hair care basket. The next membership event is a “homeroom challenge,” which will be promoted soon on this blog and the cafeteria’s bulletin board. Membership remains open at only $6. Forms are available on the OFHS PTA website and by clicking HERE. 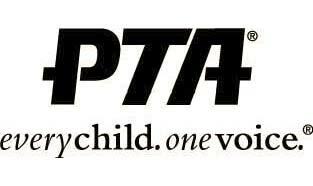 PTA’s first meeting is at 7 p.m. September 28th in the Media Center. All are welcome. Below is a list of important back-to-school events for each building. Olmsted Falls High School: 440- 427-6100; Olmsted Falls Middle School: 440-427-6200; Olmsted Falls Intermediate School: 440- 427-6500; Falls-Lenox Primary School: 440-427-6400; Olmsted Falls Early Childhood Center: 440-427-6360. Join Olmsted Falls High School PTA in supporting its North Olmsted Chipotle fundraiser. Visit the restaurant from 4-8 p.m. Tuesday, September 15th, show the flyer or tell your cashier that you are supporting PTA’s fundraiser and Olmsted Falls High School PTA will receive 50 percent of the proceeds of your order. To view the flyer, click HERE. 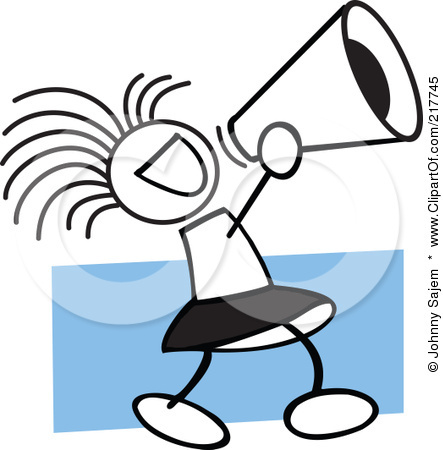 ATTN: BULLDOG PARENTS – GET INVOLVED! MARK YOUR CALENDARS FOR THE FIRST MEETINGS OF THE YEAR! OFHS Masquers & Forensics Patrons (OFHS Room W3)– Monday, Sept. 21 @ 7 pm. Please join us if you are a parent of either a Masquers or a Forensics student – or both! The OFMS volleyball program will hold volleyball clinics for Olmsted Falls girls and boys in grades K-1 this month. The time and dates are 5:45-6:30 p.m. September 15th, September 22nd and September 29th at the OFMS. The cost is $25. The program’s goal is to develop beginner volleyball skills, gain an appreciation for physical activity and being part of a team. Balloons and volley trainers will be used during skill play. Anyone wearing the Little Bulldog T-shirt will be admitted free to the October 8th Youth Volleyball Night against Midview High School. To see a registration flyer, click HERE. 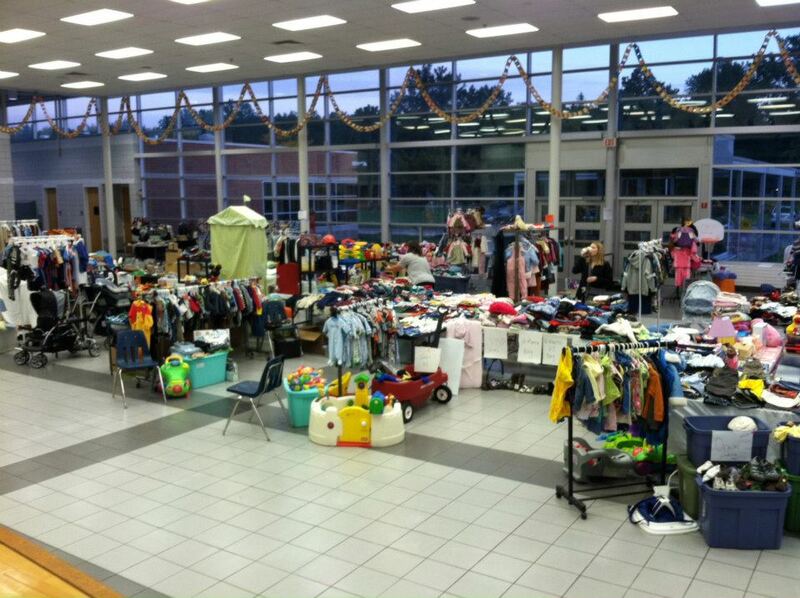 The annual OECPTA Autumn Attic Sale is from 8 a.m. to noon, Saturday, September 26, at the OFMS. The deadline to reserve a selling spot is September 16th. Sellers manage their own table and keep all of their profits of new or gently-used children’s items. There is a $25 registration fee for members per space and $30 for non-members. The Portman for Senate campaign is seeking students interested in learning more about campaigns and politics. 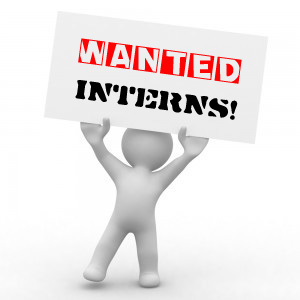 It offers flexible hours for students and willing to work with various schedules. To view an application form, click HERE. Olmsted Falls and Olmsted Township are sponsoring the annual Community Shredding Event TOMORROW, Saturday, September 12th from 9:00 a.m. to 12:00 p.m. at Olmsted Falls Middle School. All welcome! Gather any documents / files in need of shredding and come on by! 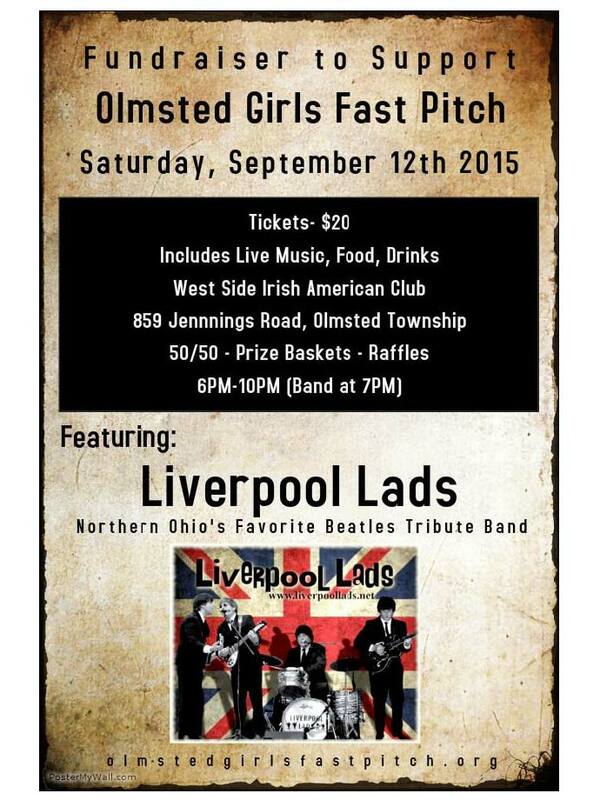 The Olmsted Girls Fast Pitch will bring the Liverpool Lads, a locally favorite Beatles tribute band, to the West Side Irish American Club on September 12th . The 6-10 p.m. event costs $20 and includes live music, food, refreshments, prize baskets and raffles. Contact olmstedgirlsfastpitch@gmail.com for tickets before the event. Tickets also are available at the door. Returning for another fun year is Saturday Activity Nights from 7-10 p.m. at Olmsted Community Center. The activities are for kids in grades 2-6. The cost is $8. All, however, must file a completed registration form before attending, which is good for the entire year. That is available online at olmstedcc.com or prepay for five Saturdays and save money. This Saturday’s theme is Bulldog Pride Night. Wear your Bulldog wear. For a flyer highlighting September activities and a registration form, click HERE. 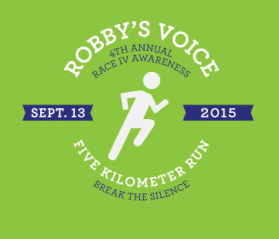 Get ready for the annual Robby’s Voice Race IV Awareness Sunday, September 13th. It includes a 5K run and 1 mile walk with a pancake breakfast – all at the Olmsted Falls Intermediate School. The race’s purpose is to raise awareness about drug addiction. Registration begins at 8:30 a.m.; followed by a 9 a.m. to noon pancake breakfast; 9:30, pre-race ceremony; 10 a.m. 5K and 1 mile walk; 11, kids dash and then the post-race awards and raffle, the latter that includes a 32-inch LG smart TV, Bose True Sound headphones and $100 cash. To learn more about Robby, an OFHS graduate, click HERE; to register for the race, click HERE and to buy raffle tickets online, click HERE. The Native Sons & Daughters program offers parents the chance to create lifelong memories with their children. 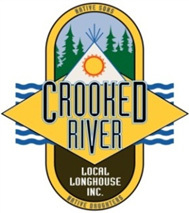 Our local chapter is called the Crooked River Longhouse. New families with children in grades Kindergarten and older may now sign up. There are two Recruiting Rally & Cookouts from 6-8 p.m. Wednesday, September 16th and Thursday, September 17th at the William J. Green Picnic area in the Cleveland Metroparks Mill Stream Reservation. Parents and their children are free to come anytime during these events. Hot dogs, drinks and desserts will be provided. The group’s officers will give a brief presentation about the program. Music, activities, a craft and displays will highlight the events. To view the club’s website and flyer, click HERE. The Olmsted Falls branch of the Cuyahoga County Library provides programs throughout the year. A list of Fall programs for youngsters, teens and adults is available by clicking HERE. 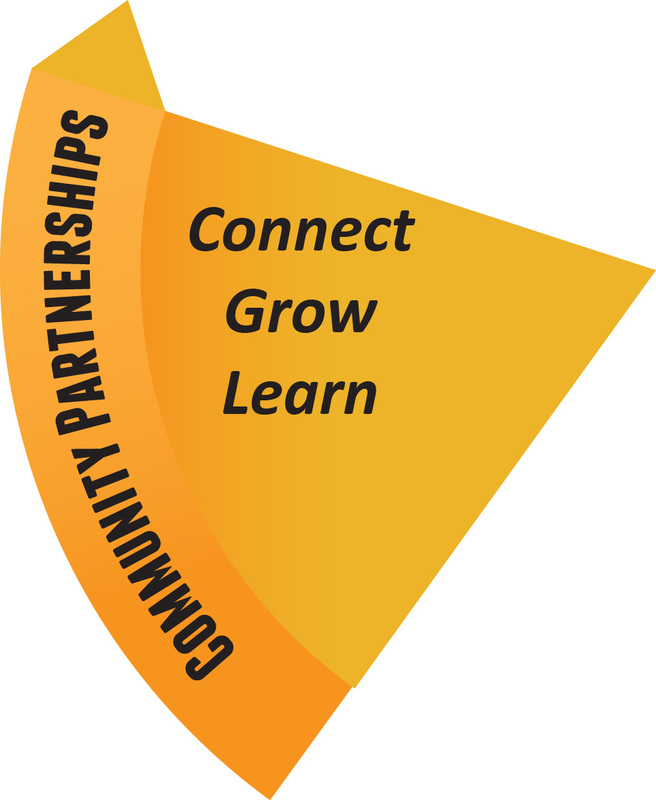 Tomorrow – Friday, September 4th – is a staff-only professional development day for the Olmsted Falls School District. There will be no school for students tomorrow – EXCEPT FOR OFHS STUDENTS ATTENDING POLARIS CAREER CENTER OR OMBUDSMAN, WHICH WILL BOTH BE IN SESSION TOMORROW. Buses this Friday will run ONLY to and from OFHS for Polaris and Ombudsman students in the morning, midday and afternoon. Students should be at the high school 5 minutes prior to the designated departure time. Students riding on these transfer buses were provided bus schedule information by their drivers last week. To view a copy of the information letter provided, please click HERE. If you have any question about the buses to Polaris and Ombudsman for this Friday, please call the Bus Garage, 440-427-6350. School will resume Tuesday, September 8th. Enjoy the long holiday weekend! The district added 857 Chromebooks to schools over the summer and 30 Android tablets at the ECC. The district also is in the process of planning a Technology Information Night for parents to give them an opportunity to learn more about the technology and how it can be integrated at home. 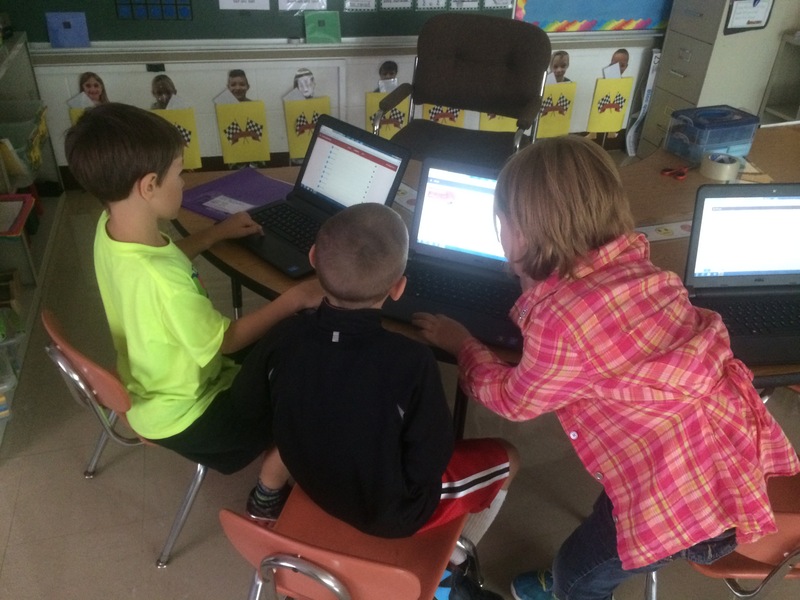 To see a photo gallery of Mrs. Megery’s Falls-Lenox students using Google classroom to work on virtual class assignments, click HERE. Jeff Coach, head cross country and assistant track & field coach, helped organize this recognition event. 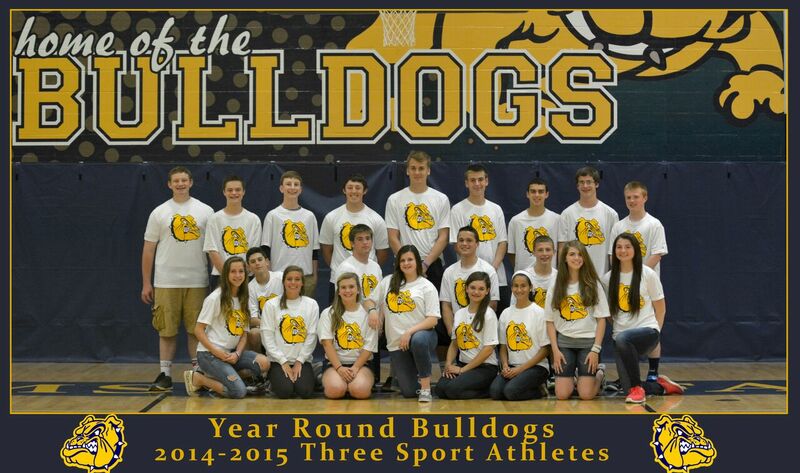 “We think that it is very important to recognize our three-sport athletes. These athletes are training and working every day of the year to better the athletic programs here at Olmsted Falls High School. They do not believe in an off-season and are constantly working to better school spirit and the overall school environment by being active student – athletes. We are proud that they choose to represent the blue and gold all year long,” Congratulations to these fine student-athletes. Pictured in the photo are, top row, left to right: Sullivan Kilbane, Zach Wolanin, Adam Skutt, Tom Brady, Ian Buchikas, Bill Wendling, Andrew Ade, Alex Bolton and Alex Kho. Bottom row, starting left, are Maggie Bildstein, Bret Asadorian, Kala Marshall, Morgan Zbin, Brice Locklear, Alexis Howe, Andrew Turski, Joselyn Rabbitt, Sarah Makari, Sam Weber, Maggie Backus and Kellie Garrity. A portion of Friday’s scheduled Staff Development Day will have District staff members learning more about the A.L.I.C.E. program, which Olmsted Falls School District plans to implement in its school buildings this year. ALICE stands for: Alert, Lockdown, Inform, Counter, Evacuate. ALICE training prepares individuals to handle an active threat within the school setting. ALICE teaches individuals to participate in their own survival, while leading others to safety. Following Friday’s overview of the ALICE program, each school building will work to adapt the protocol to their own building. OFCS School Resource Officer Gabe Smolik will be working closely with each school building to plan the implementation of ALICE. Parents can expect future communication directly from building principals on this topic in advance of any building-level drills. To learn more about ALICE, please visit the official ALICE Training Institute website. Many thanks to all of those parents and guardians who have already logged in to your PowerSchool Parent Accounts and submitted the annual required student information updates for the current 2015-2016 school year. Approximately 20% of students district wide still need to have their information reviewed, updated and submitted. Please note that this information MUST BE UPDATED BY SEPTEMBER 15, 2015 in order for your student to continue to attend school. Students without completed information/forms updates after September 15th will be prohibited from attending school until the required updates have been submitted to ensure that all health and emergency contact information is current and correct in the event of an emergency. Mrs. Corrigan shows students how to look both ways before crossing in front of the bus. Thank you to our Transportation Department for the annual bus safety training sessions presented to students at the ECC last week. The sessions are designed to actively engage students in practicing important bus safety skills that they will use everyday they ride the bus. Topics reviewed and practiced included waiting for driver to signal for safely get off the bus; designated “point of safety” (the spot where the children are to stand so the driver can see them, count them, and know that they’re all safe before he/she pulls away); and safely crossing the street. To view a gallery of photos from the bus safety training, click HERE. 11th – WEB Football Tailgate: 6-9 p.m. Wear your Bulldog gear, bring a friend and cheer the Bulldogs to victory at the Helping Hands Tailgate this Friday, September 11th at our football stadium. Food and fun begin at 6 p.m. prior to the 7 p.m. kick off. Helping Hands participants and chaperones will sit in designated bleachers at the south end of the field. Look for the tent that will have tables with snacks. Pre-registration is a must by 3 p.m. Sept. 8. To download a registration form, click HERE. Questions? Contact Mariel Krakowiak, 440-427-6086 or mkrakowiak@ofcs.net. Students in kindergarten through grade 5 are invited to cheer at the Friday, September 18th varsity football game vs. North Ridgeville High School at our stadium. Each participant must attend the Cheerleading clinic, which is scheduled from 6:30-8 p.m. September 15th for grades 3-5 and 6:30-8 p.m. September 17th for kindergarten through grade 2. 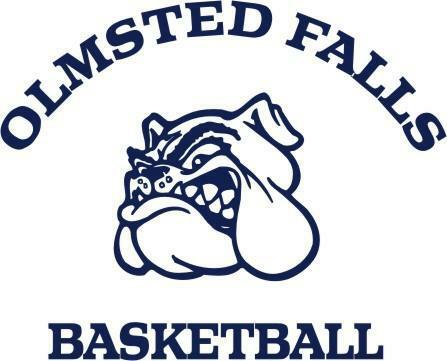 The clinic will be at the Olmsted Falls Intermediate School gym and led by Bulldog cheerleaders. Each participant will receive a Mini Cheer T-shirt, free admission to the game and a snack at the game. The cost is $20 for the first child in your family and $15 for each additional one. To download a registration form, which has a September 9 deadline, click HERE. Questions may be answered by emailing ofhscheerleading@gmail.com. OFHS PTA Meeting – Monday, Sept. 28 @ 7 pm. Presale tickets will be on sale at OFHS in the Student Office from 7:30 a.m. to 2:30 p.m. To view a list of the dates presale tickets will be sold, click HERE. Adult presale tickets, however, will only be available for HOME games. Tickets are $6 and will be sold in the OFHS Student Office. Student presale tickets are $ 4 and will be sold for every varsity game at all school buildings. 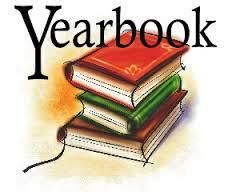 The 2014-2015 yearbooks are now available for pick-up in the student store for those who pre-ordered last year. A limited number of additional copies are also available for sale for $60 each. So buy yours today, before they are sold out! Registration is open at the OFHS Hockey Golf Outing September 19th at the Emerald Woods Golf Course in Columbia Township. The entry fee is $80 a person and $340 for a team. The 4-man scramble shot-gun start includes 18 holes of golf with cart, breakfast, lunch, dinner, refreshments, prizes and other amenities. For more details, contact Laura Wilson, 216-965-3384, lauraskater@yahoo.com; Coach Brian Thompson, 216-470-2822, brianthompson@sbcglobal.net or click HERE for a registration form. To see a pamphlet of the event, click HERE. The Olmsted Girls Fast Pitch September 12th will bring the Liverpool Lads, a locally favorite Beatles tribute band, to the West Side Irish American Club. The 6-10 p.m. event costs $20 and includes live music, food, refreshments, prize baskets and raffles. Contact olmstedgirlsfastpitch@gmail.com for tickets before the event. Tickets also are available at the door. The center is at 859 Jennings Road. Start stretching for the annual Robby’s Voice Race IV Awareness Sunday, September 13th. It includes a 5K run and 1 mile walk with a pancake breakfast – all at the Olmsted Falls Intermediate School. The race’s purpose is to raise awareness about drug addiction. Mail-in registration must be received by September 9th.